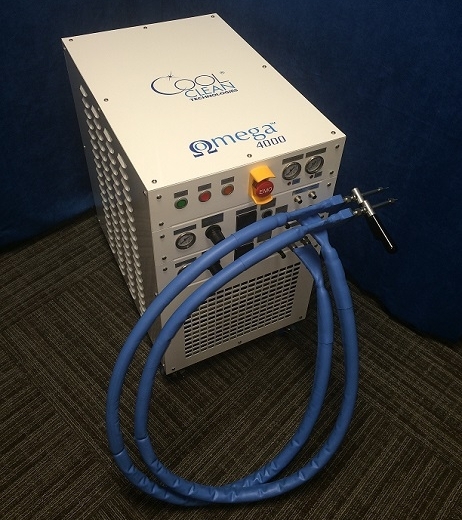 The Omega™ 4000 CO2 cleaning module provides powerful dry ice cleaning and surface preparation. The CO2 integrated spray is capable of quickly removing thin film, dust, and other surface contamination without damaging the part. Uniquely designed, this compact cleaning unit comes in a stainless steel or powdercoated white frame. Test results have proven surfaces are prepared as good or better with the Omega™ 4000 than using etchants and dangerous solvents. An optional, powerful combination of atmospheric plasma technology and integrated CO2 spray can be used to further break the bonds of tough organics. A final pass with CO2 spray removes the remaining debris, leaving a clean and high energy surface for bonding, coating, encapsulation, or under-fill processes. Cleaning with non-contact surface inspection.